Add additional character to your timber up and over door with Garador's Chevron design. The Garador Chevron is a natural timber up and over garage door manufactured from the finest wood available into an arrowed design. Embracing the natural warmth of wood whilst meeting the needs of the highly diverse garage door industry, Garador have created a highly successful range of Timber up and over garage doors to meet even the most niche tastes. The Garador Chevron is a tongue and groove solid cedar garage door and is crafted from the highest quality timber. This traditional method of construction creates a design which would enhance the appearance of any home. All timber doors are built around a steal subframe providing structural stability and inherent strength. With initial and regular staining, the door will keep its stunning appearance and last a lifetime. Constructed from beautifully machined solid cedar and fine exterior quality plywood, the Elizabethan door range offers excellent value for money. Timber garage doors combine the warmth and beauty of real wood and the very best of Garador garage door engineering. There is nothing to beat natural materials and no matter whether you choose a solid cedar or Elizabethan style door - a timber door is a sensible choice as well as an aesthetic one and with the right care and attention will last for years to come. All Garador timber doors are manufactured with the same high degree of craftsmanship to get the best from this natural material. For example, all cedar rails have chamfered edges and boundary joints creating a neat finish. All doors are supplied with a neutralising base stain and ready for on-site finishing. As an option, we offer a factory colour finish in different stains. 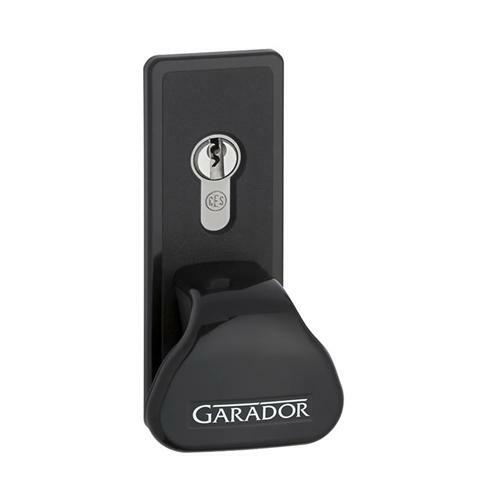 The Garador Chevron is supplied as standard with a black handle and base plate. 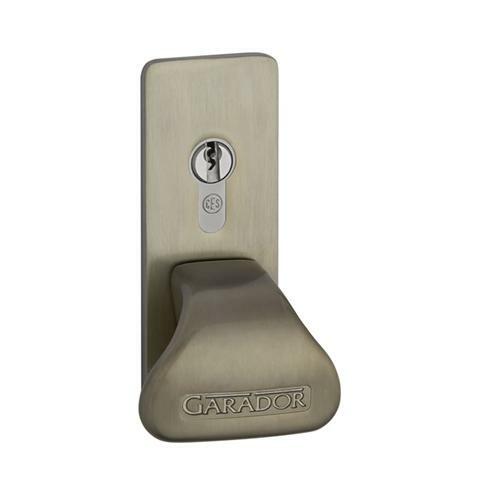 It is also available with a brass effect, chrome effect or white handle as an optional extra. The doors can alternatively be supplied undrilled and without handle and locking mechanism for use with electric operator. Both the Garamatic 9 and 10 are the optimum remote controlled garage door openers for Garador up & over doors. They are simple to use, come equipped with a useful soft start/soft stop system, include automatic safety reversal when encountering an obstacle, offer an integral light when activated and is housed in a stylish plastic cover. The GaraMatic 9 comes with two 2-button hand transmitters as standard. The Garamatic 10 comes with a 5-button and a 2-button (black) hand transmitter as standard. However any of the accessories below are available to suit your remote operation tastes and needs. 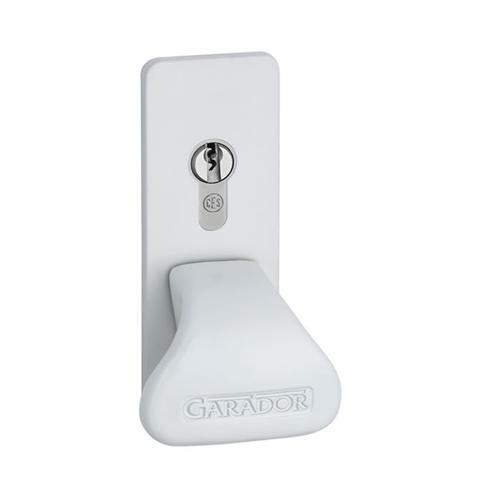 GaraMatic operators and Garador garage doors are a tried and tested unit hardware, perfectly matched and prepared for easy installation. For your safety all GaraMatic operators supplied by The Garage Door Centre comply with the latest European standards (BS 13241) such as automatic reversal and self-monitoring closing forces. 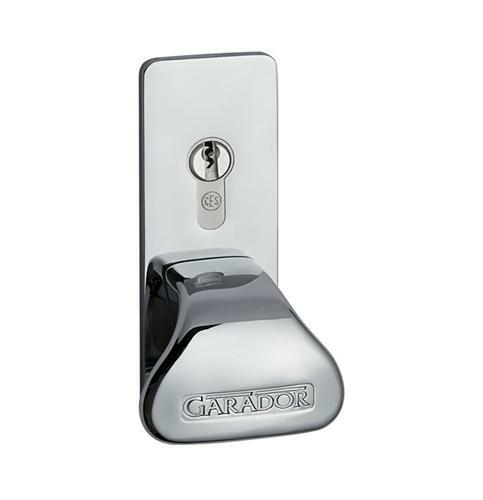 Security is provided by the integral anti-burglar device preventing the door from forced unauthorised entry. The Garador timber up & over garage doors are constructed from solid red cedar. With initial and regular staining, the door will keep its stunning appearance and last a lifetime.